Emanuel Sweert, born in Holland in 1552, spent most of his life working as an artist in Amsterdam. He was also an entrepreneur selling various items, including plants, to wealthy patrons. Sweert originally produced his work, the “Florilegium” in 1612, as a deluxe trade catalog of his plants and bulbs for sale at the annual Frankfurt Fair. It was originally published in Frankfurt, Germany at the bequest of the Emperor Rudolph II. Due to it’s popularity, it was later republished in Amsterdam in 1614, 1620, 1631, 1647 and 1655. Sweert’s fame as a floriculturist was widespread, and at one time he was even the prefect of the gardens of Emperor Rudolf II. The “Floriligium” contained brief catalog labels in Latin, German, French, and English, and featured some 560 plants and flowers. 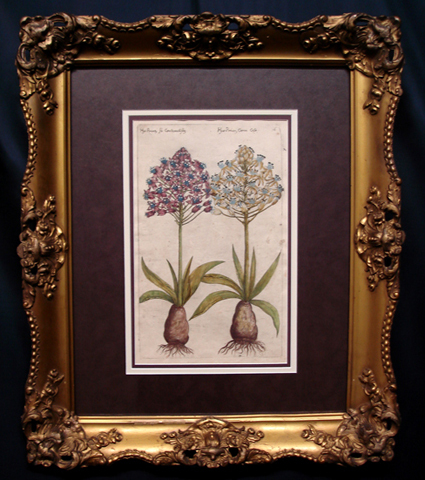 Some of the plates were copied from De Bry’s “Floriliegium novum”, published one year earlier.